The more movies I watch, the more I tend to think documentaries offer the best hit-rate in cinema. (Herzog would take issue with me here and say that documentaries should not be categorised apart from fiction – to him, they are all films, and while I agree with this I am separating them to make my rather simplistic point.) There’s plenty of pap, of course, but then there are films as sublime as Spellbound, films which find great stories in the everyday and present them in a way that captivates and extends far beyond their seemingly limited focus. I laughed, I thought deeply, and I was brought to the verge of tears twice – once in sympathy, once in elation. The spelling bee is an American tradition that hasn’t really affected the rest of the world, kind of like baseball. It’s huge there, but we don’t give it a second thought. 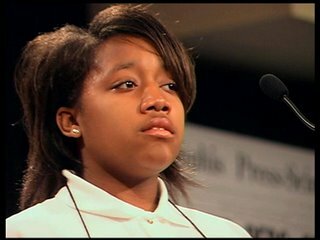 Each year, around 10 million kids up to the age of 14 take part in school spelling bees; of these, some go to the city and county competition. 249 winners will eventually take part in the National Spelling Bee in Washington, the holy grail of spelling. Jeff Blitz chose 8 kids from very different backgrounds and went to their homes to interview them and their family, then followed their progress in the national competition. His film shows that the simplest ideas and methods are often best, especially in film – tell the story straight, and if it’s good, people will listen. Of the eight, three are the children of immigrants. Angela is the daughter of a Mexican couple who speak no English; Neil is the son of a wealthy, extremely driven Indian couple; Dupur the daughter of a relaxed Indian couple, almost a direct contrast to Neil’s parents. These three families epitomise the American Dream. They came to America with the express purpose of finding a better environment for their children to grow up in, and, in different ways, they all feel they succeeded. The American Dream is usually talked about in terms of opportunity for wealth and success for the individual, but Spellbound showed that it has much more to do with one’s legacy. Families move there simply because it has more to offer their kids than their home country. One gets the feeling that Neil and his father would have succeeded in any environment because they are so ruthlessly driven – Rajesh (his father) and his brother built his second house themselves, brick by brick, and the way he walks around his neighbourhood, it’s like he owns the whole street. Still, he is at pains to point out the difference between their current position and where they were, how it is immeasurably better here. Most poignant is Angela’s dad, who earns barely more than the paltry pay he used to get in Mexico, but he is happy that he has done well because his children are happy and advantaged. The kids of each of these families are very much Americans, and their parents couldn’t be happier. The American kids are equally diverse, from a hyperactive, incredibly annoying boy to a black girl from a poor Washington, D. C. neighbourhood who just loves words. While the kids themselves are quite fascinating, it’s the interviews with their families that are most illuminating. They offer insight into the incredible strength of the family bond, the importance of hard work, the sometimes anti-intellectual attitude of many Americans (including children), and a lot more which I’ve forgotten – indeed, it seemed like every time one of the parents said something, I immediately started thinking hard about the implications of what they had to say. It’s not earth-shattering stuff, but it is broad and affects pretty much all of us. Quite apart from being an endlessly intriguing document of Americana, Spellbound is, in its final half hour, filled with tension. Even though you’ve only spent about ten minutes in the company of each of these children and their families, you really feel like you know them, so when you see them get up on that stage it becomes almost unbearable. Up to this point, Blitz’s editing work has been impressive, but it is during the rounds of the spelling bee that it achieves greatness. He cuts between the child on stage and more interview footage from before and after the event – kind of like a reality TV show, except good, and you actually care for the outcome. Many times I gritted my teeth and gripped my head in my hands, wishing aloud that they would spell the word correctly. My hat is off to you, Mr. Blitz, for making me care so much about a child getting a string of letters right. It becomes clear by the end of the film that all the people in the film are very similar. They have had vastly different life experiences, but they share many similar philosophies. A lesser film would have placed the differences at the centre of our attention, because it’s easier to extract drama that way; instead, Blitz somehow finds common goodness in virtually everyone. He’s taken a simple idea and chosen a simple structure to present it in, and the result is a success on every level. There is no manipulation, no artificiality. He gets everything out of the material without ever making his presence felt. It’s all about the people, and despite whatever first impressions one might make, they are shown to be amazing, important people. This is how movies should be made.